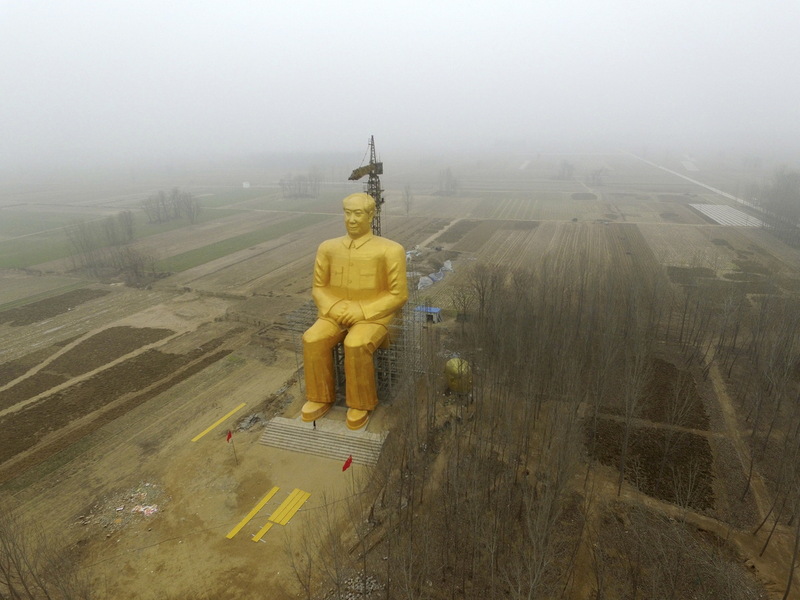 In Remote Field In China, There's Now A Giant Golden Statue Of Mao : The Two-Way The 121-foot-high statue in one of the country's poorest areas was paid for by local businessmen and villagers. A giant statue of late Chairman Mao Zedong was under construction Monday near crop fields in a village in Tongxu county in China's Henan province. A visitor to central China's Henan province might expect to see wide green plains of farmland or cliffs dropping down to the Yellow River. Now, there's a more surprising sight on the horizon in Tongxu county: a towering, golden statue of China's former leader Mao Zedong. The 121-foot-high homage to Mao sits on a wire chair, with his hands crossed in his lap, staring out onto agricultural fields. It was paid for by local businessmen and villagers and reportedly cost 3 million yuan (about $460,000), the BBC reports. Another head in Mao's likeness is placed on the ground next to the giant statue of Mao. 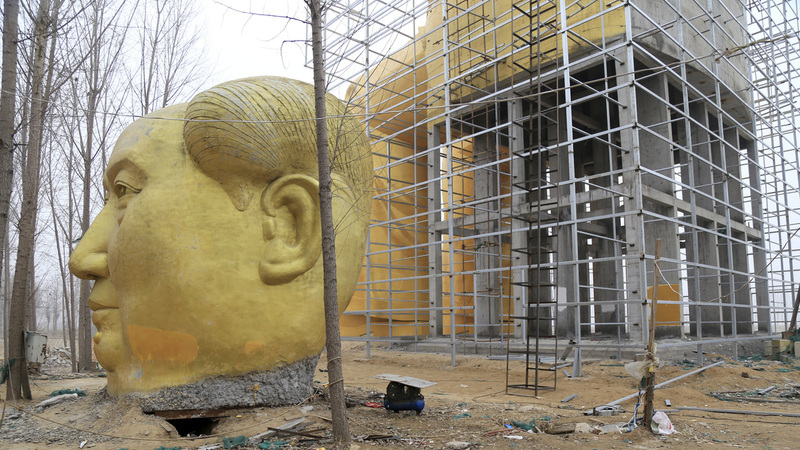 The statue is painted gold and mysteriously has a spare giant Mao head placed next to it. The founder of Communist China ruled until his death in 1976. Tens of millions of people died during his rule "through economic mismanagement and political terror," as NPR has reported. Henan province was one of the worst-hit areas of what has become known as the "Great Famine" during Mao's rule, so a statue of Mao in the middle of farmland there might seem like a surprising choice. In a book review, The Guardian described the horrors of that famine on one nearby town, where "more than a million people — one in eight — are wiped out by starvation and brutality over three short years." "In barely nine months, more than 12,000 people — a third of the inhabitants — die in a single commune; a tenth of its households are wiped out. Thirteen children beg officials for food and are dragged deep into the mountains, where they die from exposure and starvation. A teenage orphan kills and eats her four-year-old brother. Forty-four of a village's 45 inhabitants die; the last remaining resident, a woman in her 60s, goes insane." A man looks at the giant statue of Mao. The Guardian reports that the statue has drawn criticism, with one online commenter asking, "How about using the money for poverty alleviation first?" "Mao, whose portrait still stares out over Beijing's Tiananmen Square and appears on banknotes, has enjoyed something of a revival under Xi Jinping, who became president three years ago. "Mao's favorite revolutionary opera was recently remade for stage and screen while a professor at one of China's top universities has started offering an online course on 'Mao Zedong Thought'." 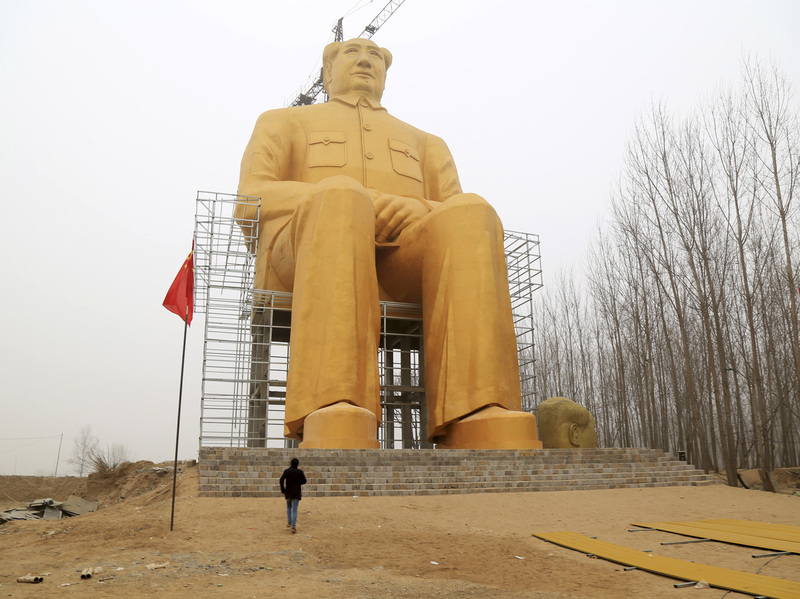 A statue depicting Mao as a young man, nearly as tall as this new one, was unveiled in 2009.